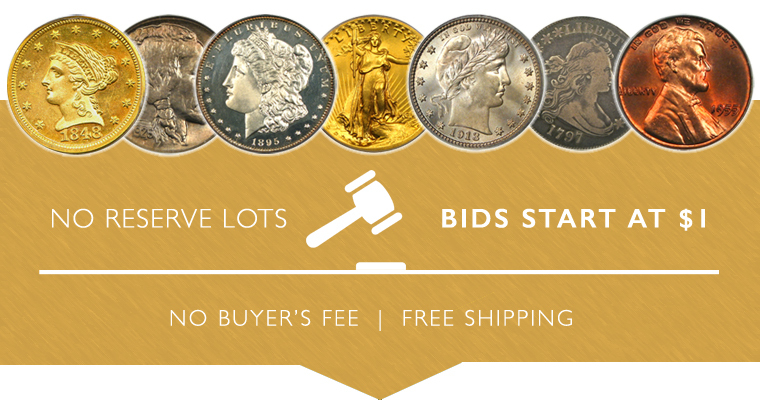 Our Sunday Internet Auction #1015 offers a fantastic selection of over 425 New Items including the Tidewater Type Collection, along with 80 No Reserve lots and 40 Vault Value items. Our first highlight is a 1799 $1 PCGS MS63 (B-16, BB-158, Retro OGH Holder). Large eagle Bust dollar type coin. Previously auctioned for over $45,000, this piece is destined for a high-end type set. This week's second highlight is an 1868 3cS PCGS/CAC MS66. Beautiful rainbow tones throughout with fantastic underlying luster. Coming from a miniscule mintage of 3,500 coins, the 1868 silver three cent is scarce in all grades and rare at the Mint State level. It is arguably rarer in Mint State grades than the 1867. Only a single coin is known finer than the present piece, placing this example firmly within the Condition Census. Of course there are many other highlights, so be sure to browse all lots in this exciting new sale before it closes on Sunday, June 3rd.